A province being named after a prominent person made me think that her house would’ve had the power to take my breath away with its grandeur. And so with this historical tour, I was proven wrong and that prominence is also often associated with one’s great service to the people. This is the replica of Dona Aurora Aragon-Quezon’s house. Many of the late first lady’s books, photographs, paintings and memorabilia are displayed here. 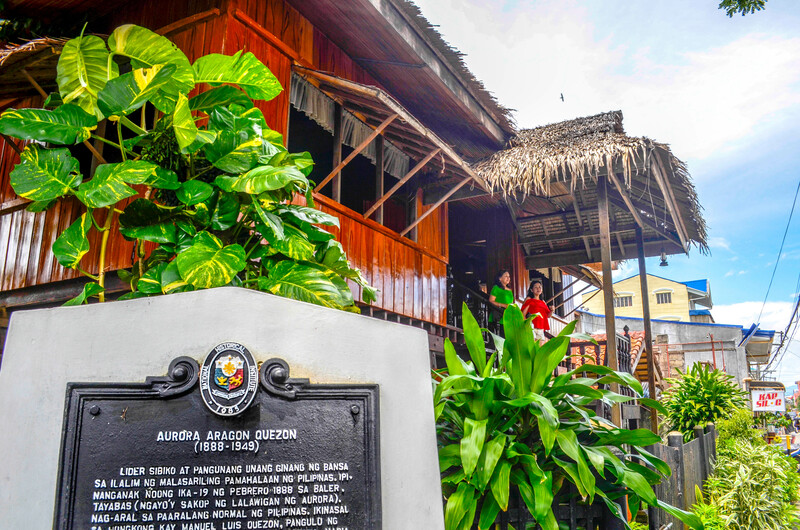 The house was was rebuilt in honor of Dona Aurora who was known for her social welfare efforts. It’s a very modest house, seemingly built on stilts. It’s made of wood, nipa and bamboo. The old traditional Filipino house came with big windows that are kept open by using bamboo or wooden sticks. By removing those, the windows close. Below is a photograph of the original Aragon house. The replica of the house, in my opinion, has been improved and seems sturdier than the original. Dona Aurora was born in 1888. She was married to the Philippines’ Commonwealth President – Manuel L. Quezon. In 1949 she was assassinated by Hukbalahap. Her humanitarian work immortalized Dona Aurora and the province where she was born was named after her. LIDER SIBIKO AT PANGUNANG UNANG GINANG NG BANSA SA ILALIM NG MALASARILING PAMAHALAAN NG PILIPINAS. IPINANGANAK NOONG IKAW-19 NG PEBRERO 1888 SA BALER, TAYABAS (NGAYO’Y SAKOP NG LALAWIGAN NG AURORA) SA PAARALANG NORMAL NG PILIPINAS. IKINASAL SA HONGKONG KAY MANUEL LUIS QUEZON, PANGULO NG SENADO NOONG 1918. MGA ANAK: MARIA AURORA, MARIA ZENAIDA, LUISA CORAZON PAZ AT MANUEL L., JR.
NAGTATAG AT NAGSAGAWA NG IBA’T-IBANG BATAYAN NG KAALAMAN PARA SA MAMAMAYAN, LALO NA NG KABATAAN, SA BALER UPANG MAPAUNLAD ANG KARUNUNGANG BUMASA’T SUMULAT AT MAITAGUYOD ANG MGA TUNGKULING PAMBAYAN. MAKARAANG MAMATAY ANG PANGULONG QUEZON (1944) NAG-TAGUYOD NG MGA GAWAING PANLIPUNAN AT PANRELIHIYON PARA MAPABUTI ANG PAMANTAYAN NG PAMUMUHAY AT PAGBIBIGAY NG KARUNGUNGAN AT BIYAYA SA MGA KAPUSPALAD. NAMUNA PARA MAKILALANG ISANG PAMBANSANG SAMAHAN ANG KRUS NA PULA AT NAGING UNANG BABAENG PANGULO NITO. TINANGKILIK ANG PAGTATAYONG-MULI NG MAKASAYSAYANG SIMBAHAN NG BALER. HABANG PAUWI NG BALER, TINAMBANGAN NG ISANG PANGKAT NG HUKBALAHAP SA NUEVA ECIJA AT KASAMANG NAMATAY SI MARIA AURORA, MANUGANG NA FELIPE BUENCAMINO III AT ILANG KAIBIGAN NOONG IKA-28 NG ABRIL 1949. BILANG PARANGAL SA KANYA, ITINATAG ANG SUB-LALAWIGAN NG AURORA NOONG 1951 SA PAMAMAGITAN NG BATAS NG REPUBLIKA BLG. 648 AT GINAWANG LALAWIGAN ITO SA BISA NG BATAS PAMBANSA BLG. 7 NOONG 1978.